Borough To Take Away Wood Stoves? — The People's Paper & Make A Scene! Borough To Take Away Wood Stoves? As many residents of the Mat-Su Borough know, John Moosey, the borough manager, has been pursuing a Memorandum of Understanding (MOU) with the State Department of Environmental Conservation (DEC) to control air quality. This agreement will enable the Borough to regulate how private individuals heat their homes, negatively impacting household budgets, and create new regulations for the already struggling Mat-Su economy. It will also allow the Borough to increase the number of public employees by using EPA grant money that may or may not be available in the future. As I explain below, Moosey is literally buying into the EPA’s false assertions regarding “harmful” smoke dust from your wood and coal stoves. In order for Moosey to “fix the problem”, he will need to increase the employees in the Borough’s Planning (zoning and regulation) Department, tasking them with creating regulations for approval by the Assembly. 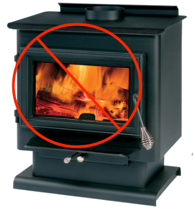 These regulations would be designed to limit your freedom to use your wood and coal stoves during the coldest days of the year. If you think this is government overreach, we are in agreement. Some of these new employees could drive along the road in a fleet of vehicles outfitted with “sniffer” devices checking for dust coming out of your stove pipe as you are relaxing in comfort. The Borough would pinpoint your house with these “sniffer” vehicles and later send you a letter asking you what you use to heat your home. The wrong answer or the wrong type of stove may get you a warning, possibly even a fine. This story sounds like pure insanity, except that it is already happening in the Fairbanks North Star Borough! Sadly, Moosey is creating a smoke screen of deception as he works with the EPA and the DEC. He has bought into the unsupported claim from the EPA that the dust from wood and coal stoves called PM 2.5 is harmful to your health. Steve Milloy hit the nail on the head with his 4/6/2017 article in the Washington Times when he said, “The only time EPA told the truth about particulate matter was when it told its human guinea pigs that the experiments were harmless.” The EPA’s findings have rightly been called junk science. Clearing the smoke screen enables you to recognize that concern over PM 2.5 is deceptive. PM 2.5 is the name given to dust about 1/30th the diameter of a human hair. It wasn’t the material that was named, but the size of the dust. PM 2.5 dust comes from burning fuels such as wood, coal and oil. It is also produced from burning organic materials like cigarettes, marijuana and other items. The Borough has been testing PM 2.5 levels, but Moosey has not investigated its source. Without that information, how does he know what should be regulated? It is also important to note that the EPA can and has adjusted their threshold downward at will, increasing the potential of violations. It makes one wonder if they ever want us to meet their threshold. Moosey produced a report upon Assembly to request to justify the agreement with the DEC. His report claims that, “PM2.5 is associated with more severe health consequences,” listing several in the report. The Borough Planner could not show the correlation between the air quality in the Butte where PM 2.5 readings were collected and any of the health issues reported when asked by Assemblyman McKee. His report isn’t worth the paper it’s written on. Health impact of PM 2.5 and federal highway money are in no way dependent on an agreement between the Borough and DEC. The real issue here is that Manager Moosey wants to increase regulations and grow government. If the Mat-Su Borough follows the Fairbanks model, it will seek federal grants which will force us to conform to EPA guidelines. Then it will hire 9 zoning and regulation employees designed to work on air quality issues. And what would these planners do in the winter when they are not creating air quality regulations? They would probably spend time with community councils creating additional zoning restrictions which often are implemented without the knowledge or consent of those impacted. Many of the Buffalo Mine, Soapstone, Sutton, Lazy Mountain and Meadow Lakes residents have suffered from this same type of government overreach. The solution is simple: The Assembly should direct Manager Moosey to terminate the current agreement with the DEC and end this deception. Both Alaska State Statute AS 46.14.400 and the Borough Attorney confirm that the agreement is NOT necessary. Moosey should focus on his real job rather than make the lives of Mat-Su Borough residents more difficult. The State, not the Borough, is responsible for maintaining EPA compliance.